Thanks again Paul and George for your exceptional work. Your craftsmanship is something to be truly proud of and we are very happy with the end result. New life breathed into a 90 year old lead light which looked ready for the bin. just a quick e-mail to say we couldn't be more happy with the glass you supplied us. Installed it the weekend and has delivered everything and more than we could have imagined for our kitchen. Has WOW factor ! Attached are a couple of photo's. Feel free to add to your gallery if you so wish. Thanks for you help, advice and ultimately the finished product. Couldn't be more pleased with the service and workmanship for our window. The result was absolutely wonderful. 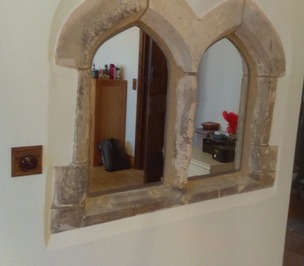 We moved into a house which had reclaimed church window arches in our bedroom. We came up with the idea of putting mirrors in them and contacted Paul to see whether it could be done. He arrived, quickly did measurements and a week later we had our the mirrors fitted. To say we are THRILLED with the result is an understatement! It is so beautifully done and Paul has made a rather random wall into a feature wall. Thank you! 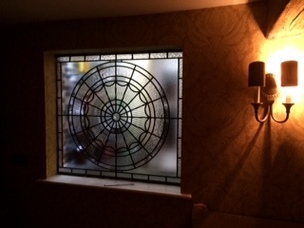 I just wanted to say a big thanks for the amazing window you did for us , it's perfect and really makes the room. I have attached a couple of pics now that the frame has been painted. We'll definitely be coming back to you to get one in the bathroom later on in the year. We would just like to say we are absolutely delighted with the fantastic hall windows you have created and installed for us. The design and colours are exactly what we wanted and the end results are spectacular. The service and craftsmanship are second to none . Paul restored an old stained glass window above our front door. This was one feature that made us fall in love with the house but it was in desperate need of repair and restoration. I wanted to say how pleased we were with the service from Paul and his team and importantly the end result. They worked quickly and efficiently and I was very happy with the cost. Thank you again. Just wanted to say thank you very much for our order for the greenhouse glass. It's getting rare to receive good customer service these days but yours is excellent! All the glass sizes are spot on & delivery to my husband's workplace was extremely fast. 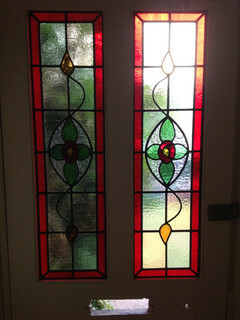 We will definitely come back again if and when we need anymore glass and will not hesitate to recommend your services. Thank You so much, we are very grateful to Mr. Paul Knight for the excellent design and professional installation. In granting the Faculty, the Chancellor said “This is an inspirational design”. 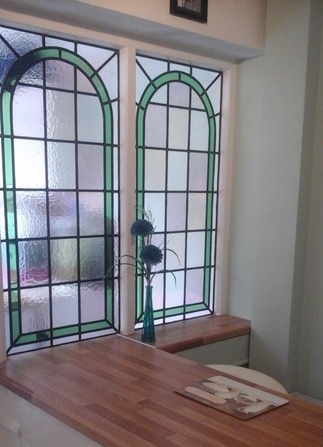 Thank you for the “ Cottage “ stained glass window which, like the two previous windows is marvellous. 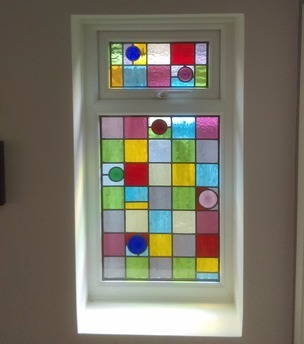 I am so pleased with what we have achieved with the three windows and extremely grateful for the care and thoughtfulness that you and your wife put into them – quite apart from the skill involved in the design and production. You clearly understood the significance of the commissions. 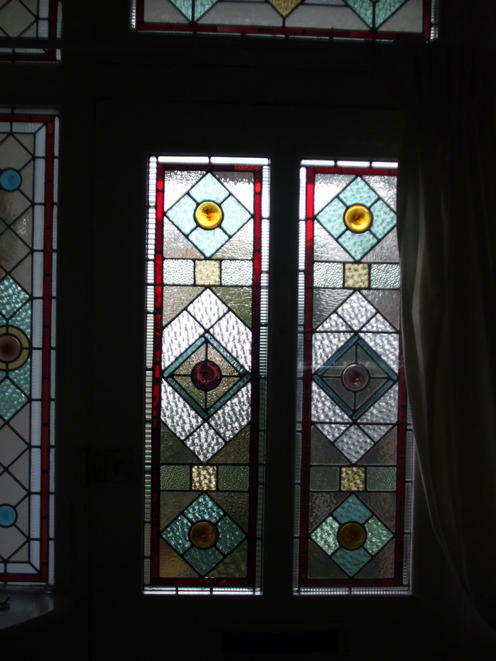 Thank you for the very prompt manufacture and glazing of our replacement leaded lights. An excellent job, they look very good and Alf and George made a really good job fitting them and clearing up afterwards. I shall certainly come back to you if and when the others look as if they need replacing. Thanks again – I’d have no hesitation in recommending you to others. Lovely professional work and a pleasure to know there are tradesmen like yourself still producing quality work Thank you. 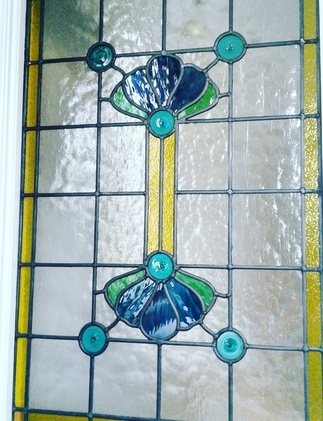 My husband and I would like to say how pleased we were with the stained glass panels you designed and fitted for our Victorian front door. 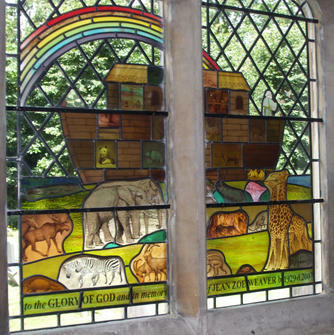 I have just seen the new window at All Saint’s Church Creeksea, I must say that it looks absolutely fantastic – congratulations and thank you for doing such a fine and prompt job for us. Thank you again for the fine work you and your son Scott carried out. 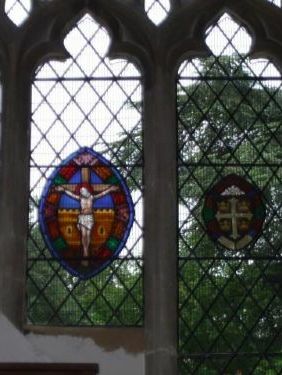 Thank you so much for a super job on the restoration of our church window. When we had a new oak front door installed I looked at many available designs for the glass panels but could not find one that was right. Eventually after much thought we decided we wanted bright colours in a random pattern and I tried to design them myself. Whilst looking on the Internet for help I came across Craftsman Glass Limited and gave them a ring. From then on the project went extremely smoothly and within 4 weeks of my call we had 6 beautiful panels installed. Paul took my preliminary drawings and adapted them to a workable design and we went to the workshop to choose the glass, leaving the final placement of colours in the pattern to Paul. We are delighted with the result, which is much admired and looks especially lovely with the sunlight shining through, and from outside at night with the light on indoors. The photo in the gallery does not do it justice! I thoroughly recommend Craftsmen Glass Limited for a quality job and 1st class service from start to finish at very reasonable rates. The job undertaken by Craftsman Glass in late 2011 involved: the removal, cleaning, repair, re-leading, and (after encapsulating within toughened glass double glazing units) the refitting of two medium-sized leaded windows, with feature coloured panes; similar work to nine leaded windows of varying sizes from our porch, with patterned clear panes; and repair and refurbishment work to other leaded windows in our house. We are delighted with the excellent result, which really shows off the leaded glass features of our (early 20th Century) house to best advantage, and has contributed to improvements to its weather proofing, thermal efficiency, and security. Paul Knight went out of his way to help us, his exceptional and rare craft skills well-supported by his wife Dawn are self-evident, and they demonstrated considerable customer care at every stage, keeping us well-informed, and availing us the opportunity to visit there workshop to view and understand the work in progress; under Paul’s supervision, I was even able to learn how to fit new lead to one of the windows, and thereby put my own small mark on the project! We are very grateful to him and his wife, and would not hesitate to ask Craftsman Glass Ltd. to carry out additional work in the future. 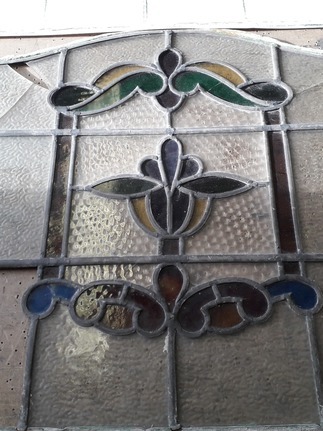 One of the leaded panels in our front door was accidentally damaged. 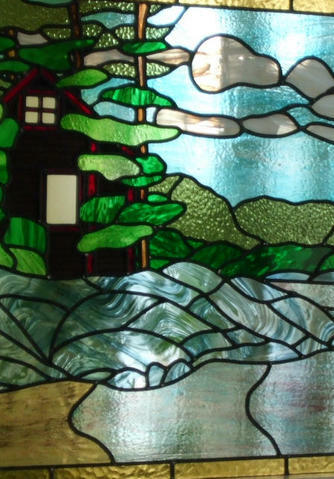 We called a local glass installer but could not help. They directed us to Craftsman Glass Limited. Some of the glass sections were damaged. I was assured that they would be able to replace them with very similar sections. I was expecting an eye watering quote, but was pleasantly surprised at what I received. 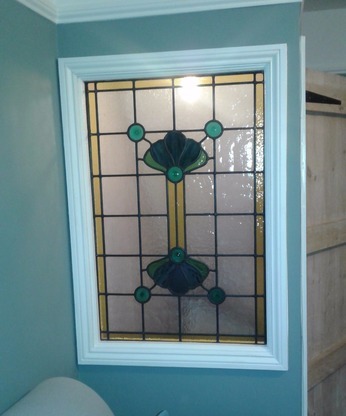 The panel was removed and replaced with a frosted glass panel. When our panel was returned, it was perfect. It showed up the other panels so much that I had to get out the Glass Cleaner. From the start to the completion of the work, Paul the owner of the company was very pleasant and professional. I would recommend him to anybody who finds themselves in a similar situation to me. 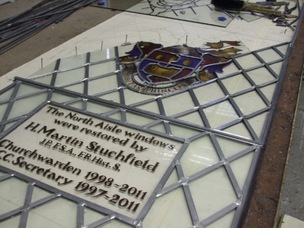 Although Craftsman Glass is based in Maldon Essex, they offer a National Service. If they were on eBay, 80 characters would not be sufficient to give them the positive feedback they deserve. 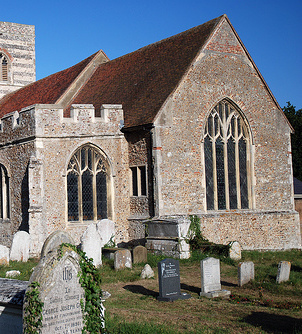 I am absolutely delighted with the work undertaken to replace the lead light windows in the north aisle of Higham Church. The whole process was effortless with deadlines continually met. We are overwhelmed by your workmanship. 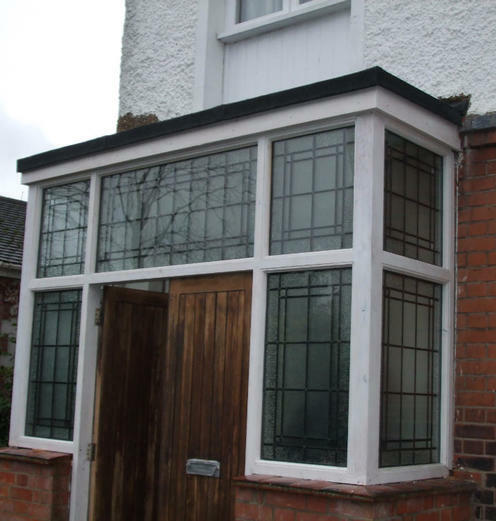 The glass panels that you created and fitted in our front entrance look extremely beautiful. Many thanks for all your hard work. 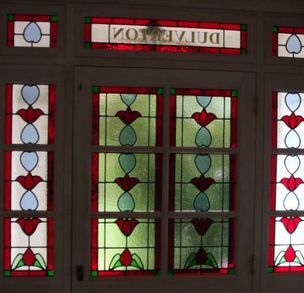 I have worked with this company over many years and have no hesitation in recommending Craftsman Glass to anyone contemplating new leaded lights or repairing ancient windows. The costs are always reasonable, the work first class and the programming of work without fault. 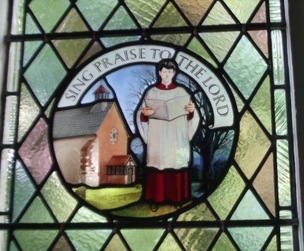 I wanted to write to say a huge thankyou to you for your kindness and generosity to us, when fitting our stained glass window Free Of Charge. 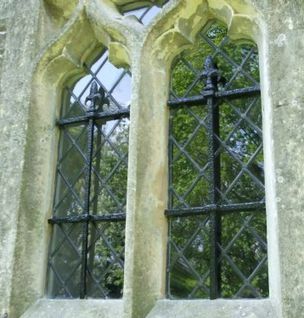 When the Children and staff saw the window for the first time they were delighted and impressed. 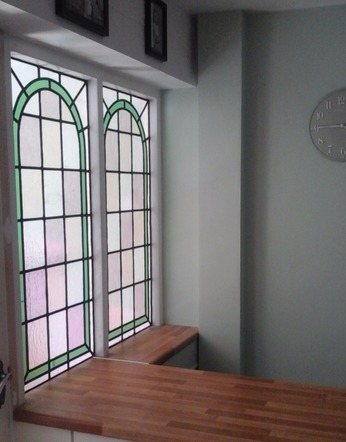 The window is a lovely centre point in our hall, particularly during assemblies. The Children all wanted to say " Thank you" and I enclose a few drawings from our younger pupils. With many thanks from all the Staff and Children at Bishop William Ward Primary School Gt. Horkesley. 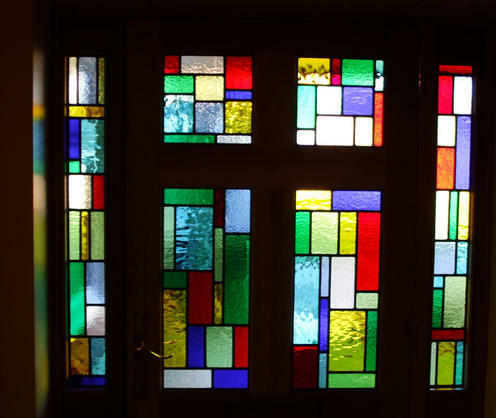 Thank you very much indeed for the beautiful stained glass panels you designed and created for our front door, they are fantastic. They really enhance our hallway and everyone comments on the way they add the finishing touch to the front view of our home.We wont hesitate to recommend you. 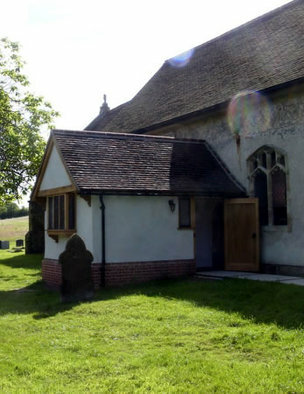 You have just completed work on our church at Gt maplestead. We are delighted with your work, it was undertaken with great care and to a very high standard. Thank you Paul from Gt.Maplestead PCC. We would recommend you to everyone. Mr. David Bessell Gt. Maplestead PCC. 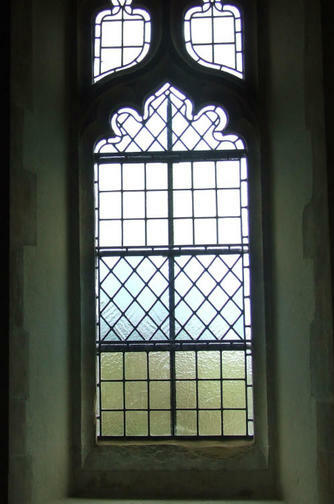 Thank you so much for fabricating and fitting the opening window in the vestry at St. Andrews Church Fingringhoe. We are all very impressed by the sympathetic design used. 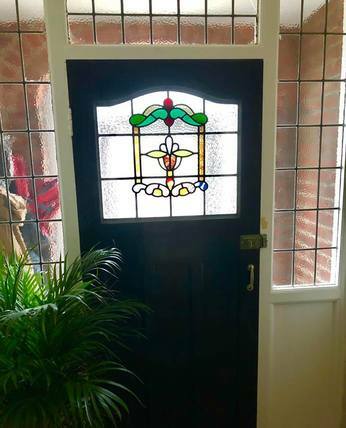 We would like to take this opportunity to express our appreciation for the first class service and workmanship of leaded lights provided to us by your company. It is a pleasure to deal with a person so knowledgeable about the glass industry as yourself. Lets hope our association continues for many years to come. 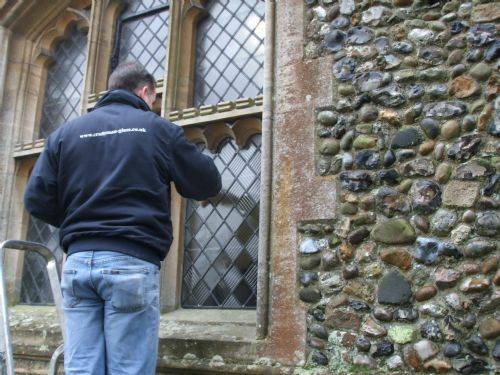 Thank you so much for all your efforts in doing such a magnificent piece of work on the North Chapel windows in St. Marys Church Bocking. The windows look Fantastic and we appreciate your efforts very much we will recommend your company in the future. 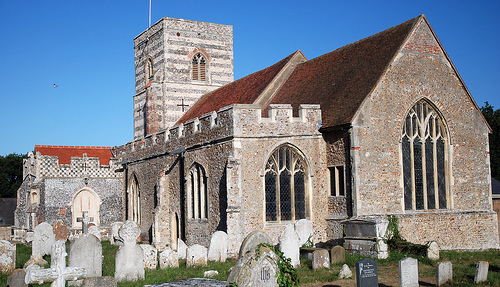 The very Reverend Philip Need.